Recently, increased isolation as well as rise in the drug resistant strains of M. catarrhalis has renewed our interest to assess the role of M. catarrhalis in respiratory-tract infections and its antibiotic profile which is absolutely essential for determining effective therapy. 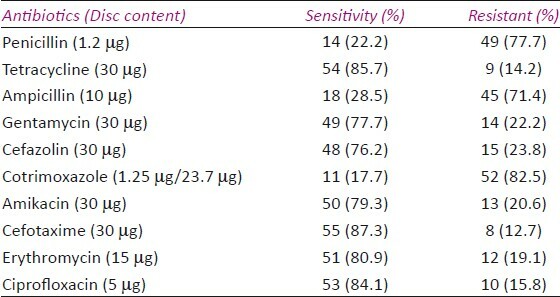 Assessment of pathogenic significance of isolates of M. catarrhalis was based on four predetermined criteria (1) clinical examination of respiratory infection based on history, examination, and chest X-ray, (2) isolation of M. catarrhalis as the sole potential pathogen, (3) Absence of antibiotic treatment in the previous two weeks, and (4) subsequent clinical response to an antibiotic to which the isolate was sensitive. Isolates were considered to be of pathogenic significance when all four criteria were satisfied. A total of 63 M. catarrhalis of pathogenic significance were isolated in pure growth. Out of 63 cases 49 (77.7%) were males and 14 (22.2%) females [Table 1]. The isolates showed maximum resistance to cotrimoxazole (82.5%), penicillin (77.7%), and ampicillin (71.4%) while susceptibility was maximum to cefotaxime (87.3%) followed by tetracycline (85.7%) ciprofloxacin (84.1%), erythromycin (80.9%) amikacin (79.3%), gentamycin (77.7%), and cefazolin (76.2%) [Table 2]. Multidrug resistance to >3 antimicrobials was seen in 22 (34.9%) of cases [Table 3]. M. catarrhalis is now considered an important pathogen in respiratory tract infections, both in children and in adults with underlying COPD. Local factors such as mucociliary clearance, aerodynamics, alveolar macrophage activity, complement-mediated killing, and surfactant activity play an important role in host defense against oropharyngeal pathogens. In COPD patients, local host defense against respiratory pathogens is relatively poor, and since M. catarrhalis is not a normal inhabitant of the upper respiratory tract in adults infections caused by M. catarrhalis are frequent in these patients. Similarly in our study >50% of clinically significant Moraxellae was isolated from more than 50 years age group. In our study, we only focused on pure isolates; however, in clinical microbiology practice it is important to realize that an additional important organism can also be isolated in about 40% to 50% of sputum cultures like S. pneumoniae or H. influenzae. ,,,[ 28] It is important to define the role of M. catarrhalis in such mixed infections, particularly with respect to the adequate management of patients with specific antibiotic therapy. In our study, resistance to cotrimoxazole is 82.5%, which practically excludes it as therapeutic option; on the other hand sensitivity to tetracycline seems to be good (85.7%). However, because of frequent side effects and various other options available like cephalosporins, macrolides and fluoroquinolones, tetyracyclines are rarely used. In our study resistance to ciprofloxacin is 16.8% while others have reported 0-1% resistance. , Overall, in our study 34.9% M. catarrhalis are multidrug resistant as shown in [Table 3], which indeed warrants reporting clinically significant M. catarrhalis. Therefore, we emphasize the ignorance of M. catarrhalis as a pathogen in respiratory tract and advice laboratories and clinicians to recognize report and treat it appropriately with antibiotics based on sensitivity to avoid therapeutic failure and serious consequences. 1. Verduin CM, Hol C, Fleer A, Dijak HJ, Berkum AV. Moraxella catarrhalis from emerging to established pathogen. Clin Microbiol Rev 2002;15:125-44. 2. Karalus R, Campagnari A. Moraxella catarrhalis: A review of an important mucosal pathogen. Microbes Infect 2000;2:547-9. 3. Tan TT, Forsgreen A, Riesbeck K. The respiratory pathogen Moraxella catarrhalis binds to laminin via ubiquitous surface proteins A1 and A2. J Infect Dis 2006;194:493-7. 4. Catlin BW. Branhamella catarrhalis: An organism gaining respect as a pathogen. Clin Microbiol Rev 1990;3:293-320. 5. Hager H, Verghese A, Alvarez S, Berk SL. Branhamella catarrhalis respiratory infections. Rev Infect Dis 1987;9:1140-9. 6. Zhanel GG, Palatnick L, Nichol KA, Low DE, Hoban DJ. Antimicrobial resistance in Haemophilus influenzae and Moraxella catarrhalis respiratory tract isolates: Results of Canadian respiratory organism susceptibility study, 1997 to 2002. Antimicrob Agents Chemother 2003;47:1875-81. 7. Fade H, Harabuchi Y, Hong JJ. Epidemiology of Moraxella catarrhalis in children during the first 2 years of life: Relationship to otitis media. J Infect Dis 1994;169:1312-7. 8. Van Hare GF, Shurin PA, Marchant CD, Cartelli NA, Johnson CE, Fulton D, et al. Acute otitis media caused by Branhamella catarrhalis: Biology and therapy. Rev Infect Dis 1987;9:16-27. 9. Varon E, Levy C, De La Rocque F, Boucherat M, Deforche D, Podglajen I, et al. Impact of antimicrobial therapy on nasopharyngeal carriage of Streptococcus pneumoniae, Haemophilus influenzae, and Branhamella catarrhalis in children with respiratory tract infections. Clin Infect Dis 2000;31:477-81. 10. DiGiovanni C, Riley TV, Hoyne GF, Yeo R, Cooksey P. Respiratory tract infections due to Branhamella catarrhalis: Epidemiological data from Western Australia. Epidemiol Infect 1987;99:445-53. 12. Boyle FM, Goerghiou RR, Tilse MH, McCormack JG. Branhamella (Moraxella) catarrhalis: Pathogenic significance in respiratory infections. Med J Aust 1991;154:592-6. 13. McGregor KB, Chang J, Mee BJ, Riley TV. Moraxella catarrhalis: Clinical significance, antimicrobial susceptibility and BRO beta-lactamases. Eur J Clin Microbiol Infect Dis 1998;17:219-34. 14. Wallace RJ Jr, Steingrube VA, Nash DR, Hollis DG, Flanagan C, Brown BA, et al. BRO-beta-lactamases of Branhamella catarrhalis and Moraxella subgenus Moraxella, including evidence for chromosomal ß-lactamase transfer by conjugation in B. catarrhalis, M. nonliquefaciens, and M. lacunata. Antimicrob Agents Chemother 1989;33:1845-54. 15. Brook I. Direct and indirect pathogenicity of Branhamella catarrhalis. Drugs 1986; 31Suppl3:97-102. 16. Brook I. In vitro susceptibility vs. in vivo efficacy of various antimicrobial agents against the Bacteroides fragilis group. Rev Infect Dis 1991;13:1170-80. 17. Budhani RK, Struthers JK. Interaction of Streptococcus pneumoniae and Moraxella catarrhalis: Investigation of the indirect pathogenic role of beta-lactamase-producing moraxellae by use of a continuous-culture biofilm system. Antimicrob Agents Chemother 1998;42:2521-6. 18. Hol C, Van Dijke EE, Verduin CM, Verhoef J, Van Dijk H. Experimental evidence for Moraxella-induced penicillin neutralization in pneumococcal pneumonia. J Infect Dis 1994;170:1613-6. 19. Doern GV, Jones RN, Pfaller MA, Kugler K. Haemophilus influenzae and Moraxella catarrhalis from patients with community-acquired respiratory tract infections: Antimicrobial susceptibility patterns from the SENTRY antimicrobial Surveillance Program (United States and Canada, 1997). Antimicrob Agents Chemother 1999;43:385-9. 20. Fluit AC, Schmitz FJ, Jones ME, Acar J, Gupta R, Verhoef J. Antimicrobial resistance among community-acquired pneumonia isolates in Europe: First results from the SENTRY antimicrobial surveillance program 1997. Sentry Participants Group. Int J Infect Dis 1999;3:153-6. 21. Manninen R, Huovinen P, Nissinen A. Increasing antimicrobial resistance in Streptococcus pneumoniae, Haemophilus influenzae and Moraxella catarrhalis in Finland. J Antimicrob Chemother 1997;40:387-92. 22. Thornsberry C, Jones ME, Hickey ML, Mauriz Y, Kahn J, Sahm DF. Resistance surveillance of Streptococcus pneumoniae, Haemophilus influenzae and Moraxella catarrhalis isolated in the United States, 1997- 1998. J Antimicrob Chemother 1999;44:749-59. 23. Varon E, Levy C, De La Rocque F, Boucherat M, Deforche D, Podglajen I, et al. Impact of antimicrobial therapy on nasopharyngeal carriage of Streptococcus pneumoniae, Haemophilus influenzae, and Branhamella catarrhalis in children with respiratory tract infections. Clin Infect Dis 2000;31:477-81. 24. Walker ES, Neal CL, Laffan E, Kalbfleisch JH, Berk SL, Levy F. Long-term trends in susceptibility of Moraxella catarrhalis: A population analysis. J Antimicrob Chemother 2000;45:175-82. 25. Wood GM, Johnson BC, McCormack JG. Moraxella catarrhalis: Pathogenic significance in respiratory tract infections treated by community practitioners. Clin Infect Dis 1996,22:632-6. 26. Barreiro B, Esteban L, Prats E, Verdaguer E, Dorca J, Manresa F. Branhamella catarrhalis respiratory infections. Eur Respir J 1992;5:675-9. 27. Nicotra B, Rivera M, Luman JI, Wallace RJ. Branhamella catarrhalis as a lower respiratory tract pathogen in patients with chronic lung disease. Arch Intern Med 1986;146:890-3. 28. Pollard JA, Wallace RJ, Nash DR, Luman JI, Wilson RW. Incidence of Branhamella catarrhalis in the sputa of patients with chronic lung disease. Drugs 1986; 31Suppl 3:103-8. 29. Powell M, Mcvey D, Kassim MH, Chen HY, Williams JD. Antimicrobial susceptibility of Streptococcus pneumoniae, Haemophilus influenzae and Moraxella (Branhamella) catarrhalis isolates in U.K. from sputa. J Antimicrob Chemother 1991;28:249-59. 30. Mickucka A, Janicka G, Krawiecka D, Kochanowska J. Antibiotic sensitivity of Moraxella catarrhalis isolated from clinical materials in 1997-1998. Medica Science Monitor 2000;6:300-4.